One of the things I find sad with today's younger photographers is the lack of appreciation for the history of the craft. Everyone is obviously digital, many of you have grown up on Photoshop and Lightroom. You're up to date on all the latest plug-ins to create some amazing images, but here's what you're missing. If you have an appreciation for the technology that got us to where we are, then I believe you can be a better photographer. I love where imaging is going and the creative tools at every photographer's disposal today. I haven't shot a roll of film myself in ten years and I love what I can do with a digital file. But, what if every time you picked up your camera you composed, exposed and shot as if there was no choice but to get it right the first time, right out of the can? Would you do things differently? Would you take more time to set up the shot? Would you pay more attention to the light, the shadows and your exposure? Would you compose differently? This is an old clip from YouTube of my old buddy Dean Collins. It's from a live program he did at Brooks Institute. Dean talks about photographing hotel rooms, which was the assignment for Hyatt. In the beginning he makes a statement about it almost being a formula and like shooting school photography, but Dean had to figure out the "formula" first. Regardless of your specialty, you need to understand lighting and there are some great tips in this short video to help you in just about any situation. Dean was only 51 when we lost him in 2005, but to this day he remains one of the finest presenters I've ever watched. He was an incredible commercial photographer, but there wasn't anything he couldn't shoot. His specialty was light - understanding it, controlling it and making it do anything he wanted. I've attended hundreds of workshops and nobody compares to Dean's style and comfort level when it came to being up in front of a crowd. He was quick on his return volleys too. Once being asked, "Dean, it's no wonder all your images are stunning, look at how beautiful all your models are? Don't you ever photograph any ugly people?" There wasn't one second of hesitation as he responded, "Of course I do and why don't you get your family and come up here right now and we'll do a portrait!" Give yourself seven minutes and enjoy this clip I found on YouTube. It's from 1998 and it was all about film and controlling the light. There was no Photoshop to do what Dean did with lights and reflectors. This is about understanding the craft. Imagine if you had the same assignment today and there was no Photoshop, no Nik, no OnOne, no Kubota Image Tools; just you, your lights, a few reflectors and your camera gear. Would you know how to do what Dean did? When you get to the point in your career where you can answer, "YES!" you'll truly be ready to take on just about any assignment! There's rarely a project that goes by that I don't think about Dean and how he would have handled some of the challenges the industry is facing today. It's amazing the things you find when you're just surfing through cyberspace! 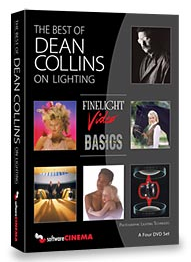 Most of you probably didn't know Dean, but his lessons on lighting were timeless. From his legendary road shows to founding Software Cinema, he set the standard for education. His contribution to the way so many photographers learned to see the light was huge. Understanding lighting is one of the key things you can do to separate yourself from Uncle Harry! So, enjoy the next two minutes as you watch the master work his magic. And, if you're looking for a more extensive trip through the mind of Dean Collins check out Software Cinema's longer videos. They've got the full set and nobody does it better than Dean!